In much the same way the Ronettes’ “Be My Baby” sets the tempo for Martin Scorsese’s Mean Streets, and Bill Haley And The Comets’ “Rock Around The Clock” does likewise for George Lucas’ American Graffiti (both 1973), the Supremes’ “Baby Love” is the perfect underscore for the opening of 1975’s Cooley High. It’s tempting to characterize Cooley High as the inner-city answer to American Graffiti—trading out Modesto’s hot rods for Chicago’s elevated trains—but there’s a specificity to screenwriter (and Good Times co-creator) Eric Monte’s memories of growing up on the Near North Side in the early 1960s that transcends mere imitation. The year is 1964, and best friends Preach (Glynn Turman) and Cochise (Lawrence-Hilton Jacobs) are navigating their way through their senior year at Edwin G. Cooley Vocational High School—and violating the Cooley Code at every opportunity. Preach is the aspiring writer with no use for a formal education, Cochise the star basketball player waiting to hear about a potential college scholarship. Both believe their talent is their ticket out of the projects, but they’re much more concerned with the ephemeral pleasures of making out with girls, shooting dice, smoking joints, sneaking into “quarter parties” (where the objective is also making out with girls), and scraping together enough cash to see Godzilla Vs. Mothra at the movies (ditto) instead of studying for their history midterm. The yearning to buck the system that suffuses Cooley High is exemplified by an early sequence where Preach, Cochise, and two of their buddies cut class to go to the zoo, which director Michael Schultz cannily pairs up with Stevie Wonder’s “Fingertips.” (Of particular note is their mode of transportation: clinging to the back of a bus.) And the hits keep coming with key moments in their lives set to such Motown classics such as the Four Tops’ “I Can’t Help Myself,” the Supremes’ “Stop! In The Name Of Love,” Martha and the Vandellas’ “Dancing In The Street,” and Smokey Robinson and the Miracles’ “Ooo Baby Baby.” That last one is strategically employed to slow things down at a classmate’s quarter party, where Preach initially strikes out with Brenda (Cynthia Davis, who was introduced in this film and never seen again), the stuck-up girl he’s trying to impress with his knowledge of poetry. Before he’s able to get very far with her, though, the party is broken up when a fight breaks out—a distressingly common occurrence, it turns out. Living as if their actions don’t have consequences eventually catches up with Preach and Cochise when they unwisely ride along in a car stolen by two of their classmates and the thieves unwisely let Preach get behind the wheel. When they’re subsequently arrested for grand theft auto, history teacher Mr. Mason (a pre-SNL Garrett Morris)—the closest thing either has to a positive male role model—intervenes on their behalf, but this leads to the widespread belief among the student body that they snitched to get out of trouble. It also marks a shift on the comedy/drama axis, as does Preach’s successful wooing of Brenda (soundtracked, appropriately enough, by the Temptations’ “My Girl”) and the dressing-down he receives from his weary mother, who works three jobs to support him and his sisters. There even comes a point where Preach and Cochise fall out with each other, but Monte and Schultz never lose sight of the goal of being as entertaining and thought-provoking as possible. 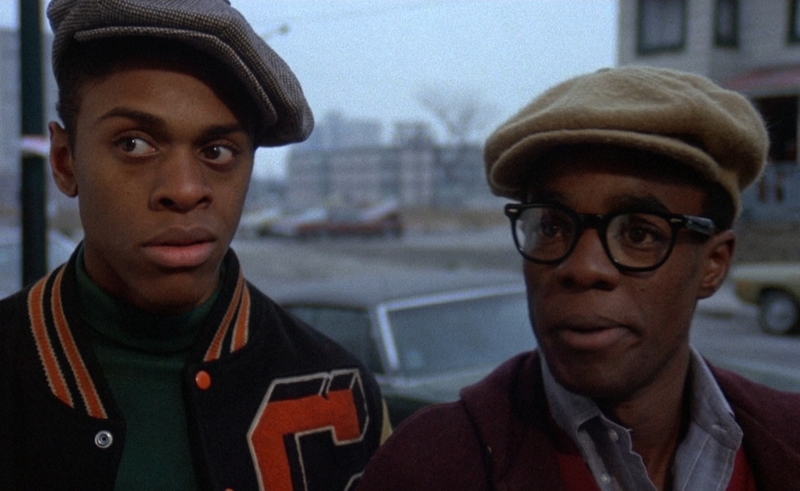 Like a good hangout movie should, Cooley High feels fully lived-in, and thanks to the talented cast of mostly unknowns (some of whom would go on to long careers, although most didn’t), even its minor characters have their stories to tell. (Borrowing a page out of American Graffiti’s playbook, it closes with title cards describing where they all wind up in the years to come, accompanied by the Four Tops’ resonant “Reach Out I’ll Be There.”) It’s also doubly nostalgic, first for the time period in which it’s set, but even more so for viewers looking back on it 40 years later. The real Cooley High may no longer be standing, but the film it inspired—and the good times it has engendered—will continue to endure for decades to come. Pour one out for the extras that ain’t here. As is standard for Olive, there are none to be had on this release, which is a shame considering how much of a cultural touchstone the film is. (It’s not for nothing that next-generation Motown act Boyz II Men covered its one original song, “It’s So Hard To Say Goodbye To Yesterday,” on their debut album, Cooleyhighharmony.) At least it looks great and is presented in its proper aspect ratio for the first time ever on home video.